No, it is not Mexican. Actually, more than 80 years ago, my husband’s grandmother from Sweden was making chili sauce which became a tradition in his family. It’s great on scrambled eggs, mixed in mayo for hamburgers, or our favorite; pot roast. Often a Sunday meal, the chili sauce was lavishly spooned over each one’s piece of roast. The recipe has been passed down for five generations. The original recipe’s measurement tools have been slightly changed for obvious reasons. It called for a bushel of tomatoes which most of us today aren’t familiar with. It also called for a milk pan of onions. Most of us wouldn’t know a milk pan if we saw it. It also called for a handful of salt which is questionable. Today’s recipe still tastes the same even with conversions. Each fall, members of my family gather to bottle this tradition. This year Ellie and I made one batch. Next week, two other grandchildren will be here to help. A quart of it is given to each family at Christmas with the understanding there is more on the shelf here at home to enjoy year around. 1. Scald tomatoes in boiling water until skin breaks, about 30 seconds. 2. Cool tomatoes. You might not have to drop them in cold water. Sometimes setting them in a tray to cool works. 3. Peel skin and remove core and cut into quarters. 4. Place in large pot and cook 15 minutes until a lighter colored tomato water rises to the top. Here is what it will look like after it cooks down. 5. Remove several cups of juice. Discard. Here is what makes it delicious! 7. Simmer 2 hours, stirring at least every 6 minutes since it scorches easily. The mixture will be thick. 8. Pour into sanitized, hot jars. Place hot lids on, screw tightly, and process 15 minutes (longer if you are at a high altitude). 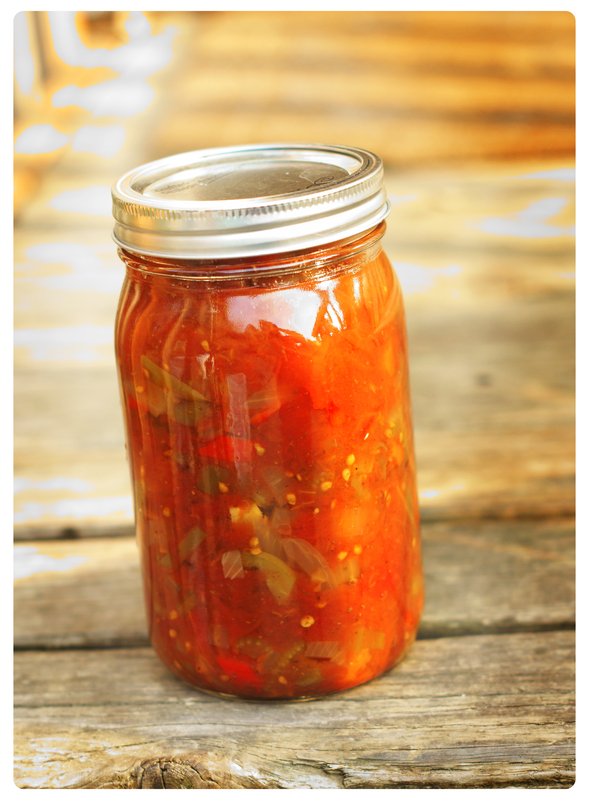 This entry was posted in Canning, Cooking, Year 'Round Harvest and tagged canning, chili, peppers, pot roast, recipe, sauce, spices, tomatoes, topping, uses. Bookmark the permalink. Hello! Yes, it is processed in a hot water bath. Hello! Our family canned a batch of this over the weekend, and we are anxious to give it a try! When you put it over a roast, do you cook it over the roast or just add it before serving? Thank you for your comment! We put it over the roast just before serving and have extra on the table for anyone who would like more. How long is it good for after you can it? Can you use it as a “chili starter”? this is it! 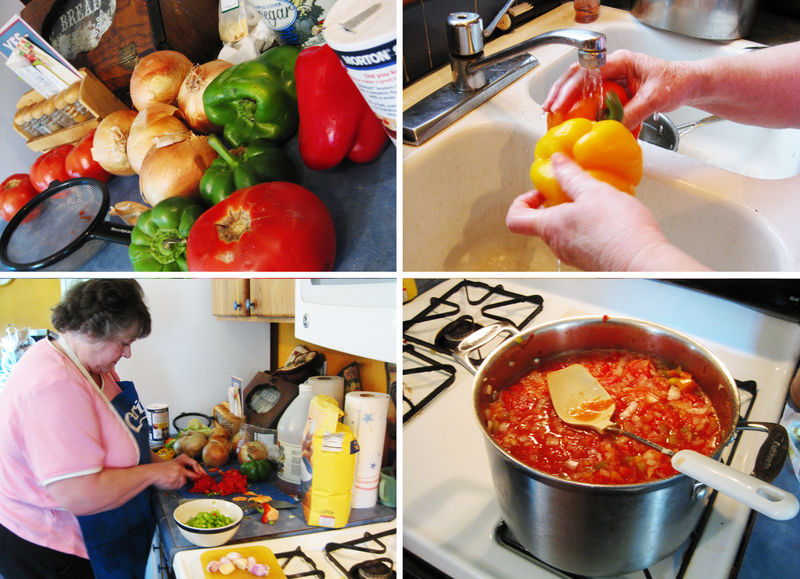 My Grandma’s long lost chili sauce recipe!! THANK YOU!! !